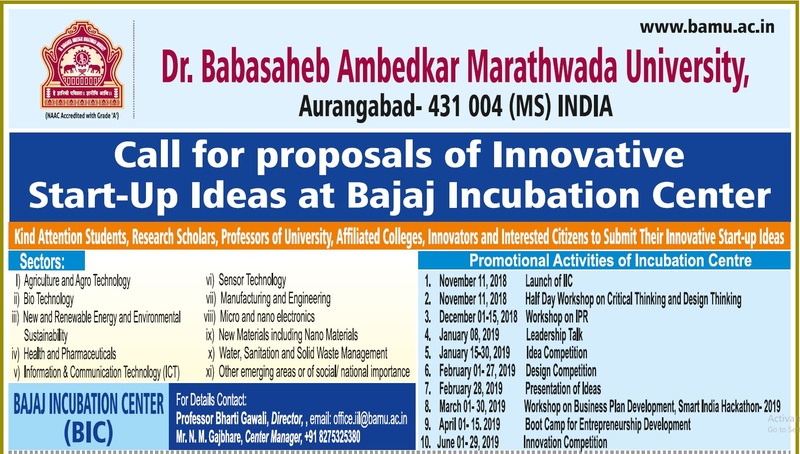 The proposed ‘Incubation Centre’ under Maharashtra State Innovation Start-up Policy –2018 is aimed to foster the ‘process of recombination of thought elements that is stimulated through conscious work at one point of time, resulting in some novel ideas at some later point of time’. The Centre aims to be a common platform for the students and faculties of the University and its underneath institution, individuals and established entrepreneurs to hone the necessary skills of market research, study of economic demands and accordingly shape the ideas to a marketable product; essentially, to the people of Marathwada (a geographic region encompassing Aurangabad, Jalna, Beed, Osmanabad, Latur, Parbhani and Nanded districts in Maharashtra) and, by and large, to the academic fabric of Maharashtra. Maharashtra State Innovation Society (MSInS) is established under Departments of Skill Development and Entrepreneurship, Government of Maharashtra with an aim to foster innovative approaches and solutions to contribute towards minimization of the economic divides in the State. Society has been registered under Society Registration Act, 1860 On 18th August 2017. The society would act as nodal agency to boost innovation driven performance and efficiency in every sector. The main objective of the Society is to provide Innovation Promotion Platform to academics, entrepreneurs, researchers and Government drawing upon national and international experiences to foster a culture of innovation in the State.